In advance: Steak should be at room temperature before cooking. Make garlic sauce. 1. Put a pot of salted water on to boil. When it boils, add pea pods, return to a boil and cook 2 minutes. Set pea pods aside. 2. Combine soy sauce and corn starch. Cut steak into thin strips and toss in corn starch and soy sauce mixture. 3. Add 1 tsp oil to dry rice and stir until rice is lightly coated. Put 2 c. water and ¼ tsp salt in heavy saucepan with tight fitting lid. Add rice and stir. Bring to a boil over medium heat, then immediately turn heat down to simmer. Cover and let simmer at lowest heat for 14 minutes. 4. Preheat frying pan over med-high heat. When pan is very hot, add a tablespoon of canola oil and thinly coat pan. 5. Add steak strips, leaving space between them. Let them stick to the pan and cook on high heat for 1 minute. Then flip over and cook for 1 more minute. Take them out and put them on a plate or in a bowl, cover loosely and let sit. 6. Add a few Tbsp of water to the pan and scrape up stuff stuck to pan. Add sauce and simmer. 7. Check rice. When rice is done, turn off heat and leave covered. 8. Add meat and pea pods to sauce and simmer just enough to warm up. Serve over rice. 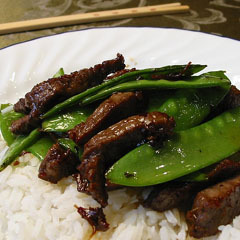 This entry was posted in Asian, Recipes and tagged beef, garlic sauce, pea pods, rice, snow peas, steak. Bookmark the permalink.